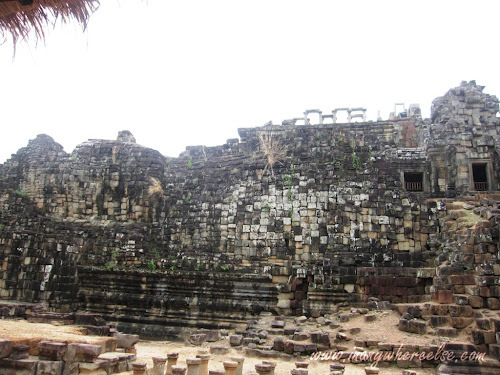 i don't have the nicest quality in my photos and i could even have the poorest there is since the angkor temples became known to the rest of the world. but then again, these were the very photos where my actual experience that day would forever be stuck in time - not even the professional photos can replace. it has been my mantra that it would be a different experience if i got to visit a place again. there would be those subtle differences that would make my experience a bit or even entirely distinct from the previous one. plain obvious in my banner. 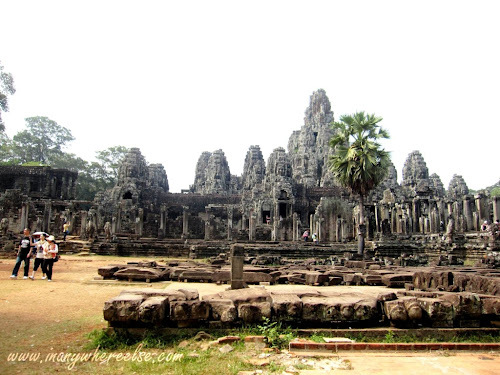 yes, there could already be millions who had done the angkor tour but i'd like to think that my experience was different, since in the first place it's the actual me who was there. 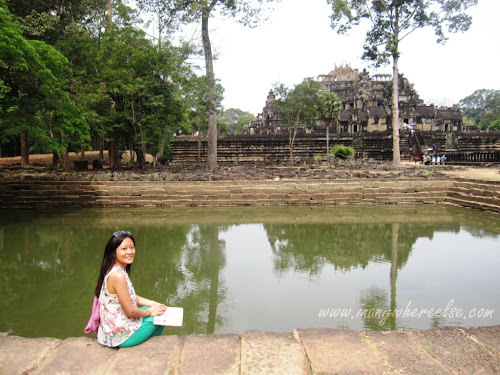 all set and ready for an exciting day ahead with an overused angkor guide booklet in my hand, eva and i started our angkor tour at angkor thom, the last capital city of the khmer empire. our tuktuk service was part of the accommodation package in our guesthouse and so thoughtful of them to provide us with bottled water to hydrate us during the day. tucked under our seats was the mighty cooler for our bottled oasis. after our tuktuk made it through the narrow roads, with a heavy flow of other touring vehicles in some parts, our tuktuk driver then dropped us off at the bayon temple. it took me a while to take in that i was finally there, while i stared at this magnificent structure built several hundreds of years ago! unique to this temple are the faces of lokesvara seemingly looking out the grand perimeter of the bayon temple. 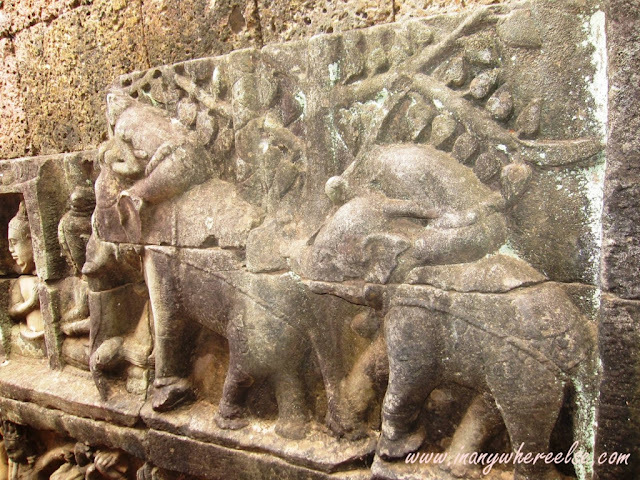 these small slabs of carved stones portray the creativity, patience, hard work and dedication that the khmers had in the 13th century which in the modern today, the nitpicking and OC-type behavior of the men who are undeniably pushing the world forward. 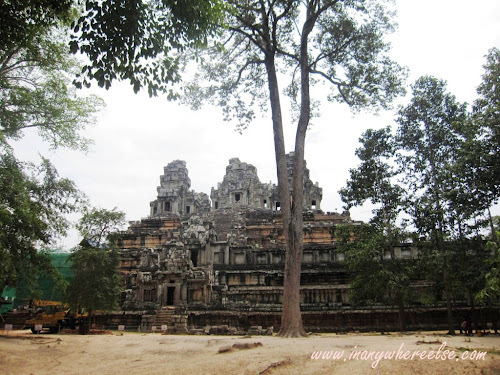 because eva and i were on our own as we roamed the angkor thom, and even the rest of our angkor tour for that matter, there was a few moments when i tried figuring out our way by referring to the tiny map in our loaned angkor booklet. 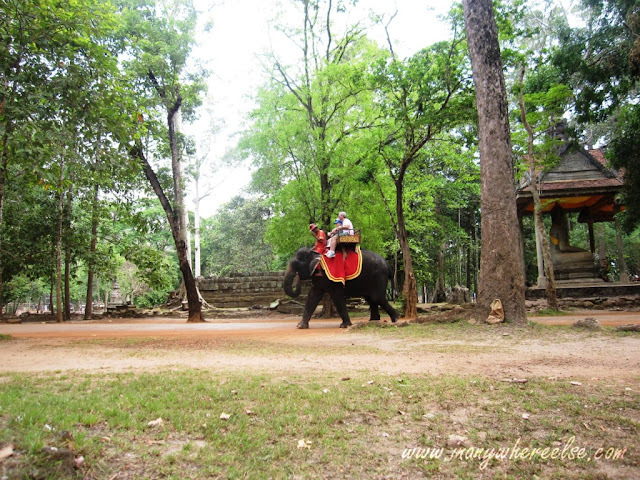 and along our presumed correct path, we met up with this hard-working elephant carrying its passengers, probably its start for the day. go mighty dumbo elephant! fly way! one trick to get away without a tour guide is to basically follow the crowd but of course, with an ounce of help from our tiny map. how amused i was at that time, was all over my face because this idea came swiftly to my whimsical mind. you see, i tried to mimic the solitary man sitting at the opposite end while he read a book under the sun and me, doing a flippant pose for the camera. and that's our handy dandy booklet right there! 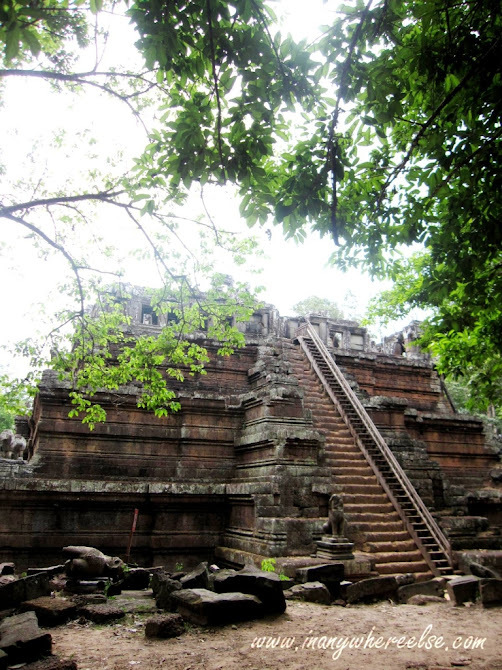 the angkor archaeological park is recognized as part of the world heritage list by UNESCO and so, the restoration works of a temple is likely sponsored by a foreign country. for this reclining buddha, france sponsors its rehabilitation. the dark moss of the stones made the buddha not easily recognizable but you surely can't miss the buddha's outline. passing through a forest with tall aged trees, this small temple with an interesting legend came into view. 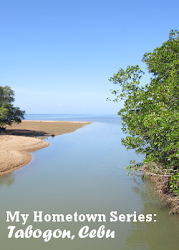 we only stared at its splendor from afar while i read the snippet of its fascinating story. a serpent (naga) was said to live in phimeanakas temple and the king that time would need to visit here every night when the serpent would turn into a woman. if the king failed on this task even for just one night, a great calamity would happen to his kingdom and he would die. hmmm, that naga! thanks to the tour groups, we finally managed to reach the terrace of the leper king and with more confidence at that on our tiny map. the above statue is only a replica of the leper king that once stood or sat rather, on top of this elevated area. 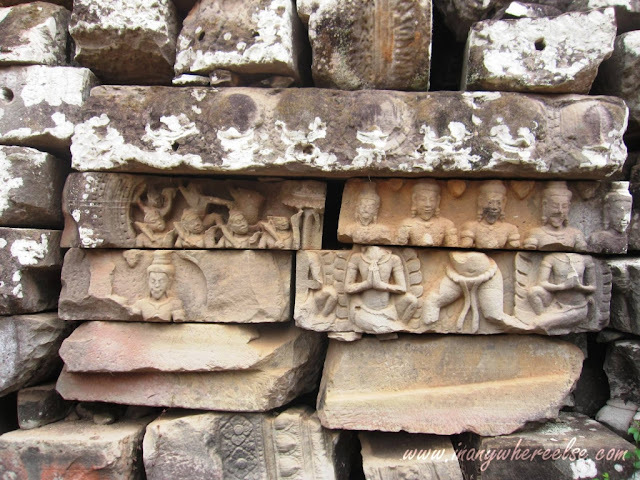 there are still many worshipers who offer prayers and light up an incense in the statue, which is an implicit reminder for tourists to tread the angkor grounds with respect. 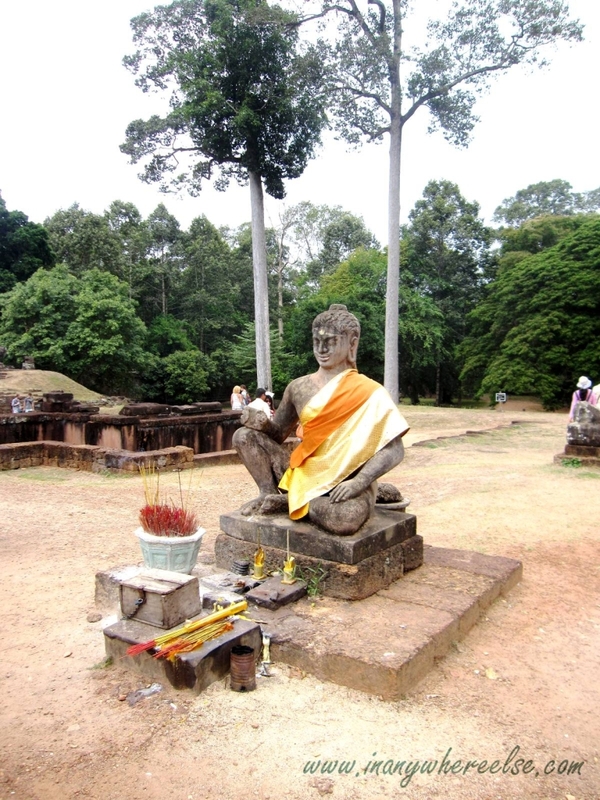 the statue got its name as leper king since the original statue was in its state of discoloration and the khmers thought of it as the king who had leprosy. today we have our cameras to take photographs and videos of the remarkable events in our lives, but for the khmers in the early centuries, they had these stones to engrave these events. just how cool is that! they didn't have to deal with viruses and hard disk crashes! maybe i should start carving in stones. that, if i have the patience or there are still stones left to begin with. using up our remaining time that our tuktuk driver instructed us, eva and i went for a while around the walls of the terraces which resembled more of a maze but with guided directions. we were following a trio that consisted of a japanese couple and their japanese-speaking guide who could have filled in more information compared to the snippets found in our booklet. but sadly, i was only able to catch up the very basic descriptions that were already obvious and the couple remarking that it was hot. one noteworthy thing i was able to understand though, was when the japanese-speaking guide remarked in disapproval when the trio and us were forced to halt at the middle of the narrow path. our stop signal was this female tourist, who took her time in taking pictures who merely glanced at us without looking sorry. hello fellow countrywoman, be considerate, ok? after an hour and a half, we reunited again with our tuktuk driver and he later dropped us off at ta keo temple that was undergoing major restoration works at that time. our driver gave us a very limited time of 5 minutes which implied we could not go around the temple or even audaciously climb up. the restoration was sponsored by china as seen in the notice board near that mini transformer crane truck. this was also where i disrupted a group of khmer kids by joining their game, before we scampered back to our tuktuk. it was then a long journey of almost an hour towards our next temple which our driver described as the lady temple - its name that intrigued us and made us nod when our driver suggested it. next is the part 2! meanwhile, here is my post as i pondered on our angkor experience.